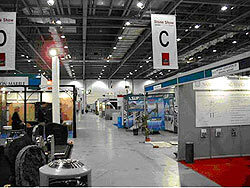 The biannual British Stone Show took place 5 - 7 March 2002 in London. Any one who has visited it in previous years will have been to the Wembley Exhibition Centre which is in a run down industrial estate in North London next to the old National Football Stadium. It was never the best location for a show as evidenced by attendance figures or at least the attendance of the right people. For some unknown reason this year it was moved to ExCel which whilst being a fabulous exhibition centre is in the much neglected area of the East London Docklands next to the City Airport and on the opposite side of the River to the Millennium Dome. The area was blitzed by the Germans in the last war and frankly little has been done to improve the general area since. The show was small by the standard of the last show at Wembley and miniscule when compared to the shows of Nuremberg and Verona- however this is where the British Stone Industry proudly displays its wares. In a single hall eight aisles by eight we had a cross section of wholesalers and producers of stone alongside machinery agents and testing houses - surprising there were two stands from Government agencies in the form of the Health and Safety Executive and the Customs Agency. There was, it has to be said a good turn out from foreign visitors , a few from India and China as well as fellow EU Members from Germany , Italy Portugal and Belgium. The noticeable trends were that Limestone is still enormously popular and showing no sign of waning. Turkey had a strong showing of travertine. Carlos Zannerotti CEO of Limestone Gallery one of London's foremost suppliers of Limestone and Travertine was one of the few stands that was very busy most of the time , creating a great deal of interest with his monolithic bathtubs in Limestone and Basalt and well as a collection of solid stone basins expertly crafted by Janotas & Simoes Lda of Pero Pinheiro Portugal. Carlos, a Brazilian with an Italian passport has been setting trends in stone for over seven years- he reinforced the opinion formed by myself and many others "I feel that whilst it has been a worth while experience for us being here - it is upsetting to see that most of the visitors are either not from London which is our main market or not the right type of customer. The show is a little off the beaten track and we will have to see what happens before we re- book for 2004"
On the machinery side it was very noticeable that the CNC machines that were starting to roll out six to eight years ago are now the norm in the worktop fabrication market and the clear thinking is that if suppliers do not tool up soon they will be fighting for a very small share of the bottom of the market. The gossip on the machinery stands was all about Intermacc parting company from Ebor their agents. Intermacc apparently are getting rid of a lot of agents and going direct . This would seem odd when Ebor have captured 80 % of the stone market for them and have now gone with Breton, presumably in other countries Breton will move in to the old dealers and meet Intermacc head to head- both are fabulous machines but Ebor have gained a reputation for service excellence that Intermacc will not be able to match. No one knows the logic behind this decision but it is going to court so some blood will be spilt in the coming months. John Burke, Exhibition Director of The Natural Stone Show and NAMM Tradex explained on the shows website www.stoneshow.co.uk , "The Natural Stone Show is designed to showcase the best of British stone. It is also an international event with exhibits from as far a field as South Korea, India, Singapore, Australia, Spain and Italy, so the move to ExCeL with its state of the art facilities and excellent transport links to London and the City Airport is not a difficult one to explain. 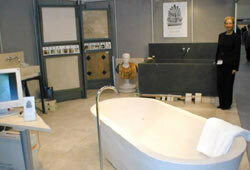 The natural stone market in the UK is very buoyant. Looking to the future we need a venue which can not only provide convenient transport links for all of our visitors but also the opportunity for the show to expand - ExCeL satisfies both requirements admirably". All I can say is John you were wrong the industry is in good shape but if it were only judged by the attendance at the show one would come to the conclusion that it is dying on its knees. If it takes two hours to get from west Central London which it did me I cannot blame the average Londoner who says that he would not go to Docklands if hell had him. The Show needs to be centralised London is far to built up and congested to able to host a show like this. If the show were in Birmingham then it would be easier for many Londoners to get to . The NEC has a rail station and an Airport -it has numerous motorway links and it is cheaper to hire space. In brief the members of the stone industry in Britain must realise that if they do not patronise the show there will be no show and the organisers must realise that to be patronised it must move, preferably to the NEC in Birmingham. Empty aisles on the first day of the show- day two was better thank fully. © 1994-2002 natural-stone.com, All rights reserved.